Children’s Mental Health Week runs from 4 – 10 February 2019. The Secondary Rights Respecting School pupil sub-group have been working to raise awareness amongst pupils, parents and staff about the range of mental health difficulties, how we can break the stigma about talking about mental health and highlight advice from the New Economic Foundation on five ways to better well-being. Primary pupils will be learning about mental well-being at assemblies and S1/2/3 pupils will be viewing a series of Powerpoints and videos at Secondary Tutor Time. S4/5/6 will view these the following week after they return from Work Experience and Mock exam leave. The Scottish Association for Mental Health offers great examples of why it’s important that we take the time to look after our mental health and well-being. The five ways to better mental health are highly relevant for all parents also. 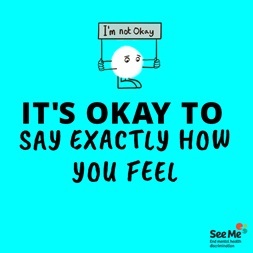 The Information for Adults and the Role of Family and Friends pages on the See Me Scotland website have excellent advice and videos from teenagers to their parents on mental health. Our NHS counsellor is in school every Tuesday. Mrs Claire Stevens is available to meet with young people or parents. Apps can also be a useful tool for pupils, parents and staff. Three that are recommended are from SAMH, the SAM APP for anxiety (these can be downloaded free to your phone) and Headspace (you need to subscribe to this). Dr Pooky Knightsmith was the keynote speaker at our promoting positive mental health and emotional well-being parent conference in November 2016. She was very well received by all. On her website you can view her series of mental health myths videos. Keeping your child safe on line is also paramount for their mental wellbeing. Safer internet day takes place this year on Tuesday 15 February. A range of resources for parents and carers are available on the Safer Internet official site. Further useful information for parents can be found on the Think U Know website.